Mention the word Tennessee, and expect a range of associations as diverse as its residents and visitors. Some conjure pictures of Nashville and its honky-tonk charm and boot-scooting tunes. Others picture Memphis in all of its Elvis-tinged, hip-swiveling glory. But those in the know get a faraway look in their eyes, as they visibly drift away, led by visions of the Great Smoky Mountains. Thanks to its central location, you can easily take advantage of all the adventure that Gatlinburg and surrounding areas offer. Gatlinburg, a.k.a. “The Gateway to the Smoky Mountains,” is known for its mountain culture, arts and crafts, bluegrass and folk music and, of course, natural beauty. Throughout its history of farming and lumber, the beauty of Gatlinburg has remained its most prominent natural resource, attracting visitors from near and far. The following are some of the region’s highlights that are fun for the entire family. Surrounded on three sides by the Great Smoky Mountains National Park, Gatlinburg is about as close as a city can be to actually existing inside of a national treasure. With more than 5,000 species of plants, along with more tree species than in Northern Europe, 60-plus native mammals and 200 species of birds located on nearly 500,000 acres, it’s an area so diverse that the United Nations designated the park an International Biosphere Reserve. The park, which is home to some of the oldest mountains in the world, formed 200 to 300 million years ago, is now one of the most visited parks in the national park system. To pay homage to two centuries of statehood and all of the history, art, music and culture that colored it, the state of Tennessee recently developed the Tennessee Heritage Trail. The trail is a commemoration and celebration of Tennessee history, and consists of three pathways. The Arts & Crafts Trail features artistic and craftsman traditions throughout Tennessee history, including candles, pottery, basket making, water colors, stage productions and more. The trail ends in Gatlinburg, where you’ll find an eight-mile loop of studios and galleries brimming with local color and character. The History Trail traces the formation and development of the Great Smoky Mountains National Park. The Music Trail highlights the bluegrass and mountain music that have served as a soundtrack to the growth and development of the area and all that surrounds it. 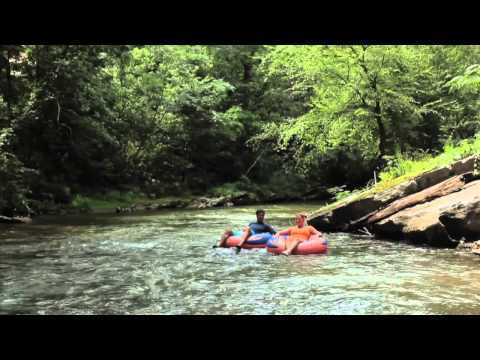 Ready for a whitewater adventure rafting in the Smokies? Rafting season in the Great Smoky Mountain and Gatlinburg area goes from March through November, and the Pigeon River takes you through the Great Smokey Mountains, Cherokee National Forest, Martha Sundquist State Forest and other stunning surroundings. Shoot through roaring rapids such as “Razor Blade,” “Too Late” and the “Vegamatic” and enjoy a heart-pounding, professionally guided adventure. By winter it’s a ski resort, and when the weather warms, an amusement park. But it’s more than just your standard amusement park—it’s an amusement park in the sky. Hop on the Aerial Tramway, a 120-passenger car that leaves from downtown Gatlinburg and heads up the mountains to your destination. Once you’ve arrived at Ober Gatlinburg Ski Resort & Amusement Park, you’ll find indoor ice-skating, an arcade, bungee run, alpine slide, kiddie land and more.